Role > Assisted creative director in the design of this unique folder. Performed all production on and created the die for the wavy side pocket. Objective > The objective was to create a folder that existed within, and could contain the family of all other promotional materials designed for this Distinctive Senior Living facility. 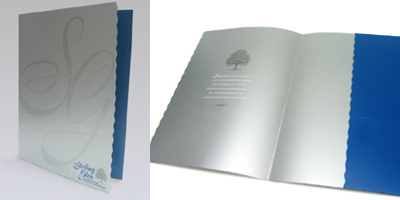 Results > The folder was elegant and a very successful solution which contained all marketing materials for Sterling Glen.